Real Madrid needed a win to go top of the table when they took on Real Vallecano this Saturday afternoon but their quest started with worst possible scenario when Embarba scored in just 7th minute while Miku doubled Vallecano lead in 15th minute. Playing with Ronaldo, Real Madrid needed a uphill task to get something out of this game and Gareth Bale got them back into the game in 35th minute while Lucas Vazquez brought them back on level terms just after the break and Bale’s scored his second to complete the turn around. Absolute cracking game as Real Madrid came from 2-0 down to draw level against Vallecano without Cristiano Ronaldo. Bale was pulled one back after Embarba and Miku had put Vallecano 2-0 up while Lucas Vazquez came on as a sub in second half for Benzema and scored the equalizer. Real Madrid were on the backfoot from the minute go in the rainy conditions as Vallecano mugged them off in early exchanges. Two goals down, Gareth Bale stepped up to get Madrid back in the game and just when it looked like Madrid will be able to turn things around Karim Benzema was forced out injured making him doubtful for Manchester City clash. Day belonged to Gareth Bale who turn up in what was a important game and scored the winning goal as Real Madrid completed a remarkable comeback from 2-0 down to win the game 3-2 thanks to Gareth Bale’s two superb goals. Last time these two meet was back in December 2015 at Santiago Bernabeu and it was a game to forget for Vallecano who were hammered 10-2 by Real madrid with Gareth Bale scoring four goals in crazy game where Vallecano had two players sent off. Rayo Vallecano were leading 2-1 until two players were sent off by first half and hour and that really gave Real Madrid an opportunity to turn things around as they put 10 past the visitors. There won’t be any coverage in the UK and if you missed the live action you can always tune in here for full match highlights and goals video available after the match is over. 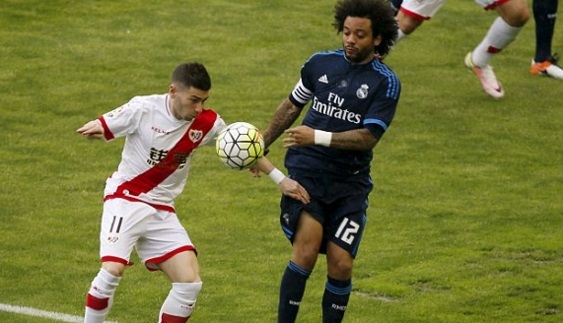 Real Madrid 10-2 Vallecano Review: That is where things started to go wrong for Rayo Vallecano. Tito was sent off with a straight red after horrible tackle on Toni Kroos in front of the referee who pulled out red without any hesitation. 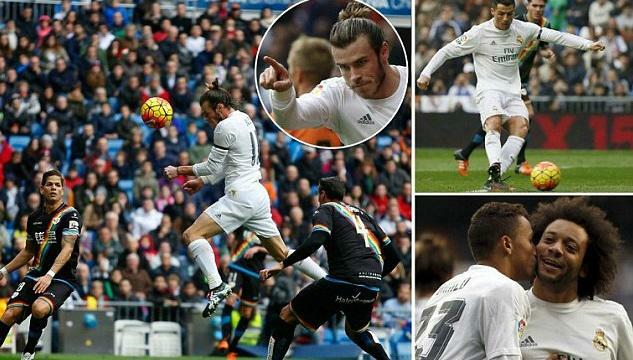 Gareth Bale brought Real madrid back on level terms with a superb header off Danilo’s cross. Things got bad to worse for Rayo Vallecano as Jose Raul Baena saw his second yellow and penalty awarded to Real Madrid which was converted by Ronaldo leaving Vallecano with impossible job of keeping Real madrid at bay for more than 60 minutes with nine men. Gareth Bale was through on goal without a defender in his sight and poked home with a neat finish to make it 4-2 for Real madrid just before the break. Real Madrid continued their assault after the break scoring 6 more goals to make it 10-2 with Bale substituted after his four goals in the game while Ronaldo scored twice and Benzema was on target as well. There were couple of penalty shouts which were not given.